‘Press Play and Record’ brings together a body of work created by EC Davies over the last three years. This includes video, animation, sound works and textiles, developing aspects of her collaborations with choirs in Berlin and North East England. Davies exchanged individual lines of song lyrics for gifts to then produce further events and actions. Lyrics and exchanges with collaborators, including spoken word recordings have been woven into this new work. One of the recurring motifs in Davies’ textile works and video pieces is the taking of religious symbols and ceremonies and reimagining them as everyday objects and the kind of rituals associated with a night out on the town. Real emotions and artifice merge and central to this is the pop song. While medieval religious congregations meditated on the suffering form of Christ on the cross, pop fans meditate on the universal conditions of falling in and out of love. Solace is found on girls’ nights out where various sisterhoods invoke mantras such as ‘I Will Survive’. 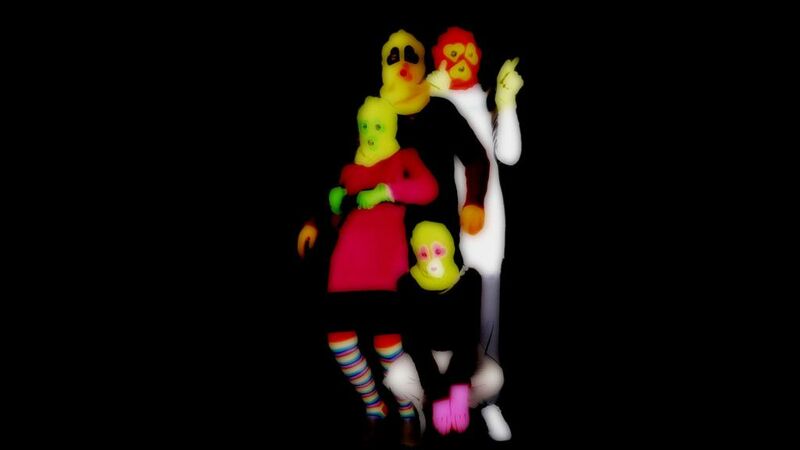 Masks, dressing up, pop song lyrics, and gestures are all reedited and recombined. 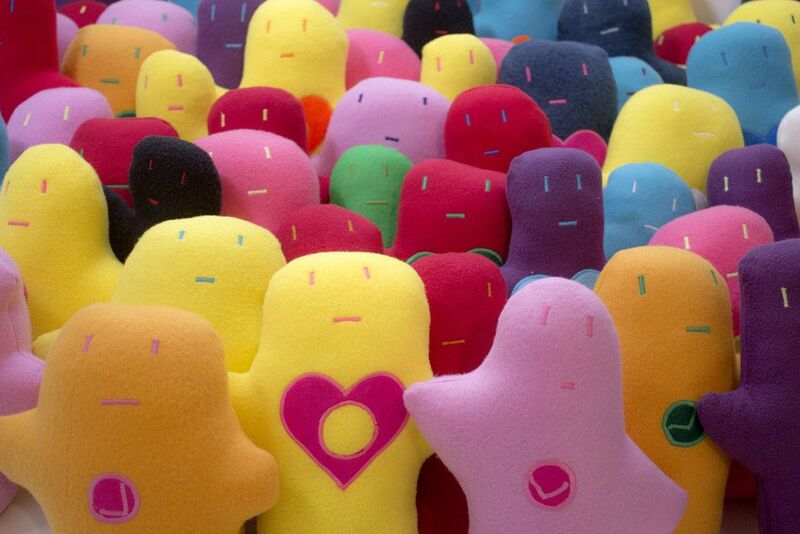 ‘Love Dolls’, central to Davies’ work, are angels in soft form, that is, cuddly toys. The cuddly toy as all children know is a kind of guardian angel protecting them at times of distress. While communal singing, which is central to many religious ceremonies, is secularised through Davies’ weekly collaborations with the Berlin Pop Choir at Monster Ronson’s Ichiban Karaoke bar in Berlin. 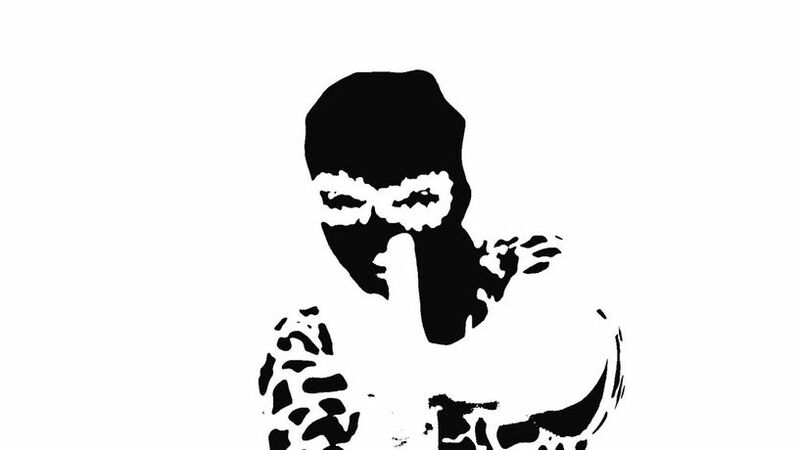 In the pseudo pop video Spring (2016) Davies dances to camera, masked and dressed in a leopard-skin print onesie. Davies creates a soundtrack built using only the word ‘spring’. Taken from the line ‘Spring’s a girl from the streets at night’ in Dirty Old Town, the song by Ewan McColl (1949), Davies cuts up, repeats and layers the spoken word frame by frame to produce the accompanying soundtrack, creating a kind of ‘techno musique concrète’. In the animated work, Follow My Leader (2017), Davies records individual participants’ movements. Digital montage brings these staged actions into the same scene, creating the illusion of communal dancing, of togetherness. This staged and highly stylised choreography is continually brought back into public spaces where the audiences again re-enact these routines, adding more and more layers. In an earlier work, Davies incorporated fortune cookies that secularised the mythical notion of the oracle. In one of her latest pieces, Take a chance on me, she introduces the game of dice into the mix of ritual. Masked players from the audience throw dice to win a prize. The game is projected onto a large screen, magnifying the action. This is the same effect that seemingly brings us closer to our favourite bands: magnified on screens in arenas, cinemas and television. Images of our musical heroes are ubiquitous: plastered across the internet, captured on smart phones and social media. This apparent ‘closeness’ is an illusion: we have no real, personal connection with these performers, only an emotional connection to their songs. Davies’ work plays with these tensions while still believing in the power garnered from snatches of pop lyrics and chance encounters. ‘Press Play and Record’ opens as part of the eleventh edition of The Late Shows on Saturday 20 May, 7-11pm. The Late Shows visitors are invited to play a giant dice throwing game whilst wearing colourful love heart balaclavas at EC Davies’ interactive event ‘Take a chance on me’, during the opening of her exhibition. Producing a winning combination will give everyone a chance to win a pair of limited edition love heart decorated dolls. Have fun, take a chance, and be part of a live piece of video art. Every player will receive a gift from the artist. Drop in again during the exhibition or view at donthinklove.com to see your contribution.